https://rising.globalvoices.org/files/2019/01/05122017-290A2873-400x267.jpg 400w, https://rising.globalvoices.org/files/2019/01/05122017-290A2873-768x512.jpg 768w" sizes=" 800px) 100vw, 800px" />Community network in Buenos Aires Cauca. Photo by Boris Guevara and used with permission from Colnodo, as well as under a Creative Commons license. This country report was written by Julián Casasbuenas G., Lilian Chamorro Rojas and Olga Paz Martinez of Colnodo. Please visit the GISWatch website for the full report which is also available under a CC BY 4.0 license. Colombia has created an enabling environment for using spectrum for the deployment of wireless networks using Wi-Fi technology and more recently TV white spaces. This is an important step for the deployment of internet community networks. However, the evolution of the community networks ecosystem has been slow and it is necessary to find the tools in order to strengthen the existing processes. In addition, other technological alternatives must be considered, such as mobile phone community networks. These have been implemented successfully in Mexico by Rhizomatica, which has set up community networks in the indigenous territories of Oaxaca. This type of network is an opportunity for rural communities, since most members of the population in these areas own a mobile phone, and its implementation can be done rapidly, improving the living conditions of disconnected populations. For Colombia it is particularly relevant to have access to community networks since they can contribute significantly to the implementation of the Peace Agreement and to the social and human development in regions traditionally neglected by governments. This report presents four community-based network experiences in Colombia. In Colombia, there is no specific policy framework for community-based networks. However, Law 1341 of 2009 defined the principles and concepts of the information society and the legal framework for information and communications technologies (ICT). Among its principles is the need for non-discriminatory access to ICTs in compliance with the rights to communication, information and education, especially for the disadvantaged population and rural areas. The law highlights technological neutrality, noting that the state should allow the use of new technologies freely. In addition, it sets forth among its goals: universal service; the deployment and efficient use of infrastructure; equal opportunities for accessing resources such as spectrum and infrastructure; and the expansion of coverage in remote areas, particularly for vulnerable populations. In terms of the radio spectrum, Law 1341 establishes that the government may set aside frequency bands for free use in accordance with the recommendations of the International Telecommunication Union (ITU) as well as frequencies without licensing fees for state social programs. In Colombia, the frequency bands that are free for use include 2.4 MHz and 5 MHz and TV white spaces in the 470 MHz to 698 MHz band. In line with its Plan Vive Digital 2014-2018, the Ministry of Information and Communications Technologies (MinTIC) has been working on two relevant issues to do with internet access. MinTIC has expanded the coverage of 4G mobile networks and deployed Wi-Fi zones free of charge throughout the national territory. It has also extended the fibre optic network, which now reaches the urban areas in over 1,075 municipalities. For the municipalities not covered by the fibre project, due to their geographical conditions, the ministry provides internet access through the Wi-Fi zones, Vive Digital centers, and some household connections using high-speed radio links. In terms of access to the internet in rural areas, the ministry has implemented a project called Kiokos Vive Digital, which involves centers located mainly in rural schools and indigenous communities. However, while these spaces are important to provide access to the population, they are too scattered and insufficient for remote rural areas. 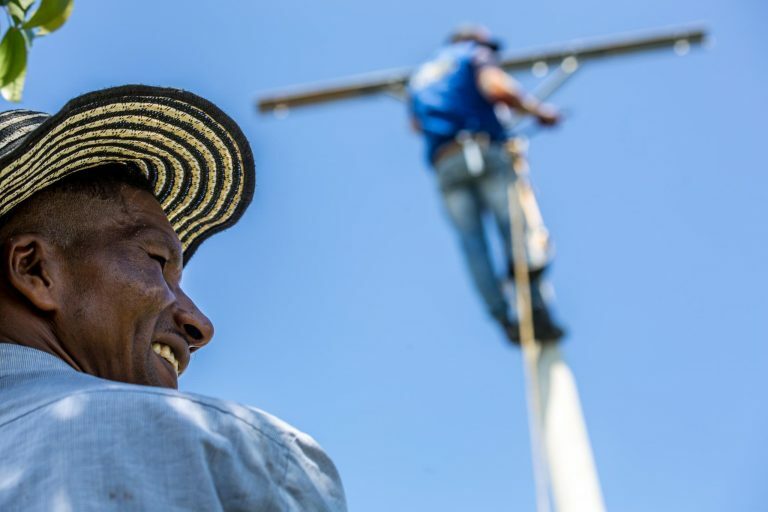 It should be mentioned that in the final Peace Agreement signed between the government and the FARC-EP, section 1.31.3 on electrical infrastructure and connectivity calls for the development of a national plan for rural connectivity that takes into account the provision of solutions for community access to the internet, the installation of infrastructure, and technical assistance that communities need. In Colombia, the community networks movement has been active for more than 10 years, with different experiences and groups working on the issue. Below we provide an overview of some of these experiences. This initiative began in 2008, led by a group of “geeks” from the free software community who were interested in open networks. They set out to support communities and help them take ownership of technology using free/libre and open source software (FLOSS). They began by installing Wi-Fi nodes close to their residences in the city of Bogotá, interconnecting them with point-to-point links. Over time they developed their own operating system (or firmware) for the routers, implementing protocols for mesh networks using 2.4 MHz and 5 MHz. The project started to grow, particularly in Ciudad Bolívar, one of the 20 localities in Bogotá, which lacks basic infrastructure and has a low-income population. In 2014 Bogotá Mesh – the name of the network there – had 86 active nodes that connected approximately 2,500 people, with up to 1,000 concurrent users. Among the services initially offered by the network were a local copy of Wikipedia, VoIP telephony using an Asterisk server, FTP, the twister microblogging platform, and even a blog with farming content. From 2008, it provided internet access to approximately 80% of the nodes via fibre from an internet service provider (ISP). The resources for the implementation of the nodes came primarily from the management group, although they received some donations. One of the biggest challenges was the ownership of the network by the community, especially for non-technical individuals. The group that supported the initiative did not continue. Nevertheless, some nodes still remain active using the firmware developed and some of its members are linked to other community network projects. This network is an initiative of the seedbed research project called Fusa Libre run by the University of Cundinamarca's Engineering Faculty. 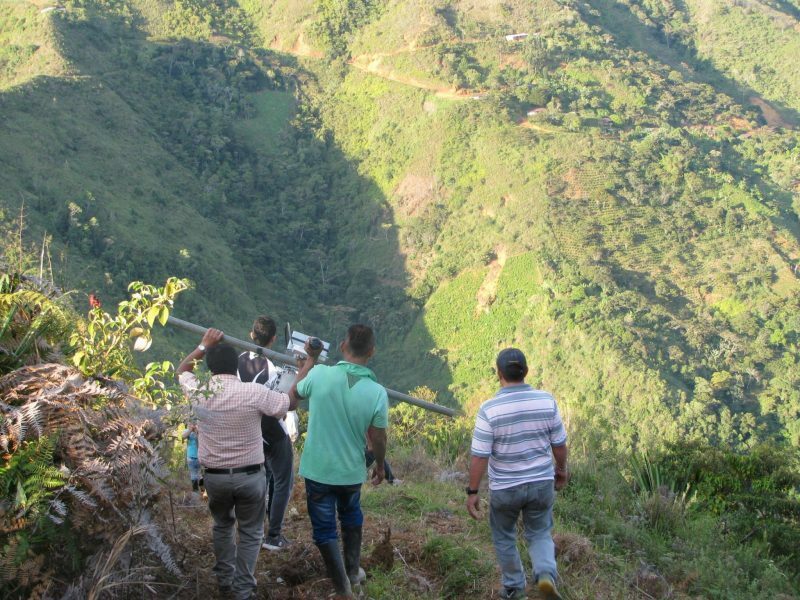 The project is implemented in rural areas in the Sumapaz region in the middle of Colombia, mainly in the rural district of Bosachoque in the municipality of Fusagasuga. In 2013 the community organized and collected money to buy the first equipment for two Wi-Fi zones. To access the internet they negotiated with people living in the nearby urban area with line-of-sight to the rural district. One urban household offered electricity and equipment maintenance in exchange for internet connectivity provided by an ISP and paid for by the community. In addition, they installed a content server using World Possible's RACHEL solution. In 2017 resources were secured through a research project proposal submitted to the University of Cundinamarca, which enabled the expansion of the network working in association with different programs (Electronic Engineering and Systems Engineering) and research groups. The research project also proposed to identify educational content appropriate for rural schools. https://rising.globalvoices.org/files/2019/01/05122017-290A2794-400x267.jpg 400w, https://rising.globalvoices.org/files/2019/01/05122017-290A2794-768x512.jpg 768w" sizes=" 800px) 100vw, 800px" />Community network in Buenos Aires Cauca. Photo by Boris Guevara and used with permission from Colnodo, as well as under a Creative Commons license. Currently in Bosachoque there are 15 nodes that work as hotspots and are connected to the university's internet network through Wi-Fi links. When the project is finished, the community will again find a resident in the nearby urban area willing to help them with an internet connection. In the near future the network is expected to have 20 nodes and install five Raspberry Pi devices with educational content. The Network Bogotá collective emerged in 2014 after meetings held at software and free culture festivals. Initially the collective met to work on different topics regarding hardware and software for community networks, as well as to share local and international experiences. Then they created a common fund for network experimentation and for deploying nodes in the homes of the participants. They approached several communities to teach them about community networks, but it was only in 2017 that the Board for Community Action (JAC) of the Villa del Río neighborhood in southwest Bogotá showed interest in the issue and convened meetings with the community. In these meetings it was determined that in some zones there were security problems. As a result they proceeded to install the first node in the JAC office, which was connected to other network nodes using mesh network protocols. They installed surveillance cameras, a digital video recorder and a community server. The success of this intervention boosted their confidence and the community was again convened to discuss the usefulness of the network. New nodes and services were installed, such as a captive portal, a community blog and more surveillance cameras, which are used by local residents to prevent crime and to control key points. The network primarily uses mesh network protocols with some point-to-point links due to the difficulty of finding a router compatible with the firmware used. The resources for this implementation came primarily from the JAC and neighborhood residents. Some organizations, such as Dongee, guifi.net and WirelessPT, among others, provided training and equipment. The computers belong to the JAC and there is no charge for access to the network. Weekly meetings are still held to discuss the project's progress, including the existing plans for increasing the number of nodes, installation of IP telephony services, setting up a radio station, and downloading Wikipedia and a virtual encyclopedia to the network server. The initiative to build this network is the result of an expressed need by communities living in the rural districts of El Porvenir and El Ceral in the mountainous area of the municipality of Buenos Aires, Cauca. 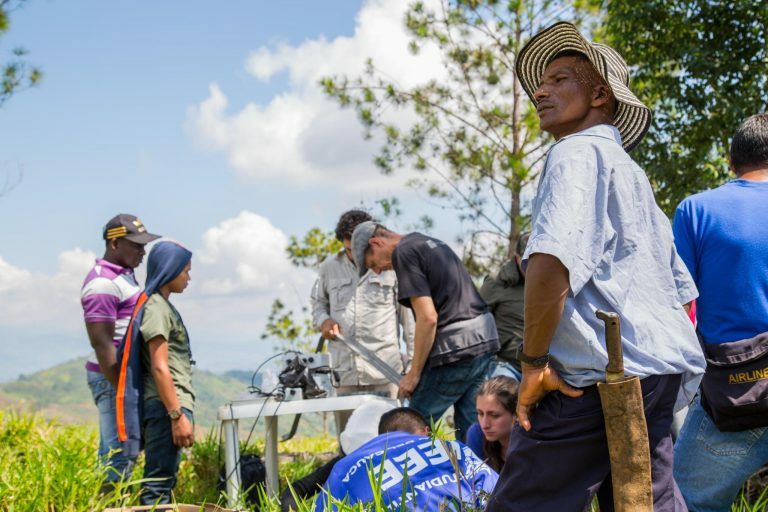 During the peace negotiations between the government and the FARC, the communities said that one of the problems in their territory was the lack of coverage by cellular networks and poor access to the internet. Colnodo had learned about the experience of Rhizomatica in Mexico and saw the opportunity to replicate this initiative in communities with low or zero coverage. In February 2017, Colnodo, with the support of the Internet Society (ISOC) and Rhizomatica, submitted a request to MinTIC to use radio spectrum in a pilot project. Unfortunately, in Colombia there is no regulation allowing the use of spectrum for mobile communications without a public auction with more than one offer, so we began to look for alternatives with the support of the National Spectrum Agency (ANE). https://rising.globalvoices.org/files/2019/01/IMG_0073-400x300.jpg 400w, https://rising.globalvoices.org/files/2019/01/IMG_0073-768x576.jpg 768w" sizes=" 800px) 100vw, 800px" />Photo by Colnodo and used with permission. While conversations were held with government actors, in the municipality of Buenos Aires there have also been workshops with peasant leaders, indigenous and Afro-Colombian communities from different villages, and other communities in the territory to review the experience of Rhizomatica with Redes A.C. Needs have been identified and principles established for the network. After obtaining the approval and commitment of the community, activities were proposed to make progress on the technical, legal, economic and organizational issues as well as key aspects for the installation of base stations for transmission. Recently progress was made with an agreement between MinTIC, the ANE and Colnodo to use a portion of the spectrum in the 900 MHz band on a pilot basis in order to help develop policy recommendations aimed at the deployment of rural community-based telecommunications networks. The pilot seeks to evaluate the technical, economic and social feasibility for implementing and operating community-based mobile phone networks in areas where there is no coverage by the commercial operators. These networks use Osmocom free software to implement GSM technology using a “network-in-a-box”. Furthermore, the pilot seeks to interconnect these networks to the closest municipality with a fibre optic link to the internet, in order to increase the reach of this infrastructure in the rural areas which are not connected. The proposal is based on international recommendations aimed at facilitating the deployment of community networks, especially in rural areas without connection or those that are under-connected, such as Recommendation ITU-D 19 “Telecommunications for rural and remote areas”, adopted by the International Telecommunication Union (ITU). It also considers the recommendations of the ITU’s Connect 2020 Agenda, the Inter-American Telecommunications Commission (CITEL), the Digital Agenda for Latin America and the Caribbean (eLAC2018 and eLAC2020), and the global Internet Governance Forum (IGF) initiative to connect the next billion users. It is also based on national legislation, the implementation of the Peace Agreement, and the recommendations of the Colombian IGF. To strengthen the potential of the network among the community, a process to discuss ownership and governance has been implemented with a focus on gender imbalances, thanks to the support of the Association for Progressive Communications (APC). For this strategy, we are carrying out ICT training workshops together with the communities and their leaders to build competencies and to visualize the potential of the network in the community before the deployment begins. The experience of the Buenos Aires community network has demonstrated how difficult it is to access the use of spectrum in Colombia for rural community-based telecommunication networks, despite the existing laws to reach underserved communities in rural areas, the Peace Agreement, and the international recommendations to facilitate the deployment of these types of networks. For almost a year and a half we have worked together with MinTIC and the ANE, and still as we write this report, the pilot project has not been implemented because of the difficulties in accessing the use of the spectrum that we needed. As a result, we still have not been able to demonstrate the technical, social and economic feasibility of these initiatives in Colombia. This delay has begun to frustrate the participant communities. Some leaders have withdrawn their support and, as a consequence, the managers of the initiative have lost legitimacy, given that the communities perceive this delay as a breach of their commitment to the project. There is a critical need for a definition of regulations that facilitate the deployment of community networks in rural areas that are disconnected or under-connected in order to contribute to the connectivity of communities. As demonstrated in the experiences presented in this report, the active participation of the community and committed leadership are key to consolidate the networks and their long-term sustainability. It is also important to build trust between the various actors involved, in order to sustain a process that demands time and dedication. It is important to point to the work carried out in the region by ISOC, LACNIC, CITEL and the Organization of American States (OAS) in the promotion of community networks. This is an important factor in influencing the different international spaces – as was the case with the eLAC 2020 Digital Agenda – and for these networks to be considered as alternatives for connectivity in the region. For more information regarding action steps for Colombia, please visit the full report on the GISWatch website.